Our balloon decorations come in different shapes and sizes to fit into any event venue you can think of. Bringing your party theme to life is what we are best at. Throw us an idea and let us wow you with the possibilities. Come discover your inner creative self with our skilful team of balloon decorators today! What’s a celebration without balloons? These whimsical balls of air are a universal symbol of the celebrations that happen throughout our lives. From our first birthday parties, to our graduation ceremonies, weddings or corporate gala dinners, nothing lifts the mood quite like balloon decorations. 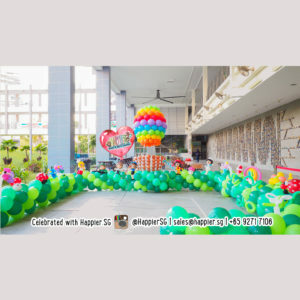 At Happier Singapore, our balloon party decorators take pride in bringing your events to life with fabulously hand crafted balloon sculptures. The sky’s the limit for our imagination. Tell us your ideas or a theme that you would love to incorporate into your party, and we’ll amaze you with the endless creative possibilities. Our balloon party decoration isn’t just random balloons placed around a room to make it look good. We add a touch of ingenuity in the styling of our balloon decor to tell a story behind the unique party experience that you’ll never forget. 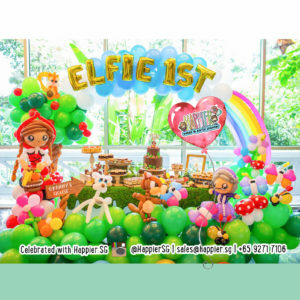 Balloon decoration is a must-have mood setter for any celebration in Singapore! Get creative with our customised balloon arches, organic garlands, backdrops, lanscapes, photo frames, columns and sculptures. If you’re planning for a surprise, be it an engagement proposal, farewell dinner or a birthday party, our talented balloon artists will gladly twist you a customised balloon sculpture for a decorative centrepiece that makes a statement. 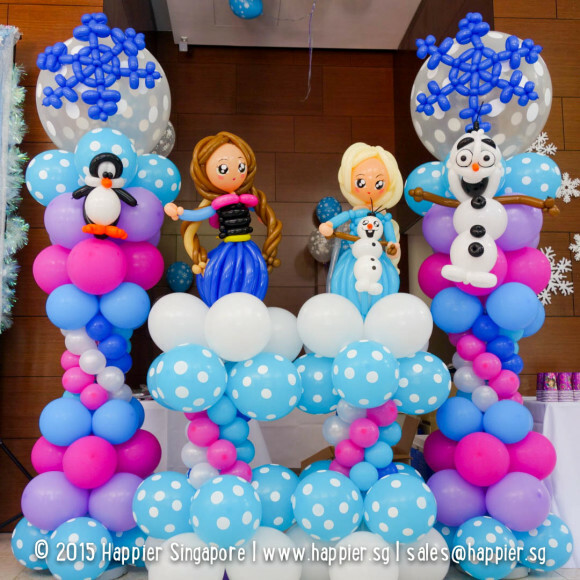 Our party balloon decorations will bring about amazement and awe to any event in Singapore. Forget about buying balloons off the shelf. 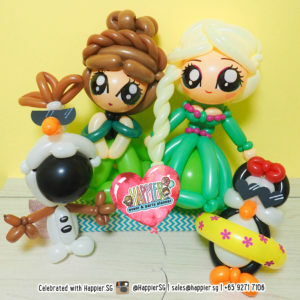 Show-off your unique personality with Happier’s team of balloon artists. 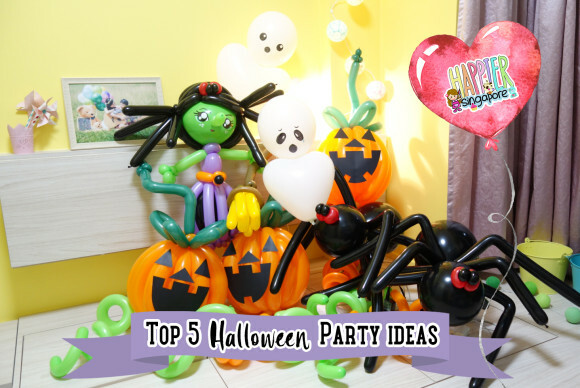 We will turn a simple idea into a mind-blowing decorative balloon bonanza. 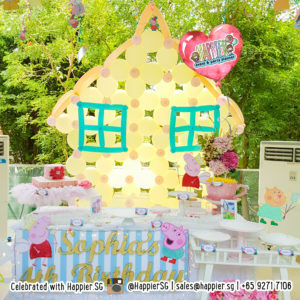 Make your next kids birthday party or corporate event an occasion to be remembered! Customised balloon backdrop decorations create a wonderfully eye-catching focal point for your event. Nothing says it better than our 3D balloon backdrops. Your guests will know in an instant that they are in for an amazing time. Balloon backdrops make great scene setters for cake cutting at birthday parties or stage decoration at corporate events. They also create fantastic photo opportunities for selfies or a tie-up with your instant photo booth. 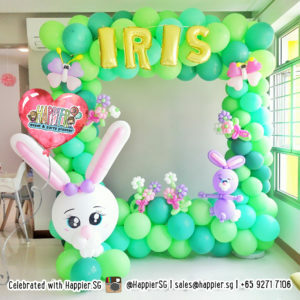 For birthday party decorations, our customised balloon arches are very effective in creating a fabulous themed atmosphere. 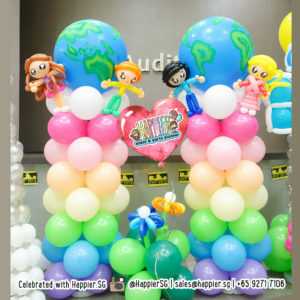 Or you can opt for stylish minimalist party decor with our birthday cake table balloon landscapes or columns topped with the cutest balloon sculpture of your child & his or her favourite cartoon character! For classy corporate events, you can take your company’s branding up a notch with this season’s trendiest organic balloon garlands, customised balloons and life-sized balloon sculptures! 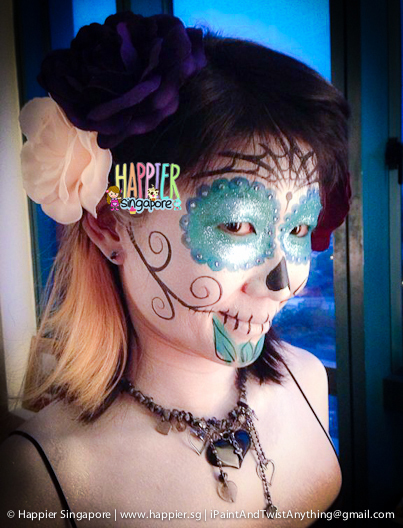 Regardless of the event venue you have decided upon, we at Happier Singapore will make it possible to achieve your dream party ambience. 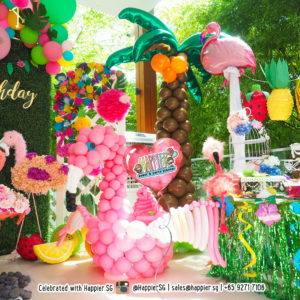 You can call the shots on your favourite theme and colors, and leave the hassles of the fitting, fabrication and installation of your balloon decorations to our reliable team of artists. Creating beautifully customised balloon decorations is what we are known for. 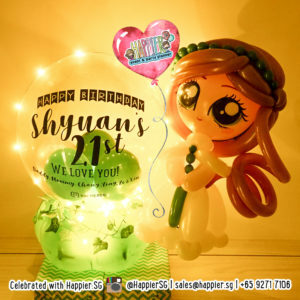 Work with us and let our balloon artists weave their magic, conjuring up the best balloon decorations for an enchanting celebration for you and your guests.